Put simply, it’s a truly first-class crossover that still functions as a functional family-friendly vehicle. The COMAND® navigation system displays 3D maps with building profiles and Points of Interest on a generous 8.4-inch touchscreen. With the Smart Key, the vehicle senses your approach and unlocks at your touch. You can then start the engine without taking keys from pocket. Fully open or close the liftgate via a switch on the interior door panel or a button on your SmartKey remote. Adjust your rear row to accommodate more cargo simply by folding down certain sections. The versatile split lets you seat two while carrying longer loads. When you load up the new Mercedes-Benz GLC, you immediately notice how much thought went into its design. Better yet, those dimensions are expertly managed for practical interior space without compromising cool exterior style. The roof line is relatively squared to help carry boxes and larger items. The strategic use of high-strength steel, aluminum, and advanced polymers allows for larger door openings, so getting in and out is never a squeeze or a bother. For easy cargo area access, rear seats fold at the touch of a button; for easy rear row access, the front seats can be moved forward. 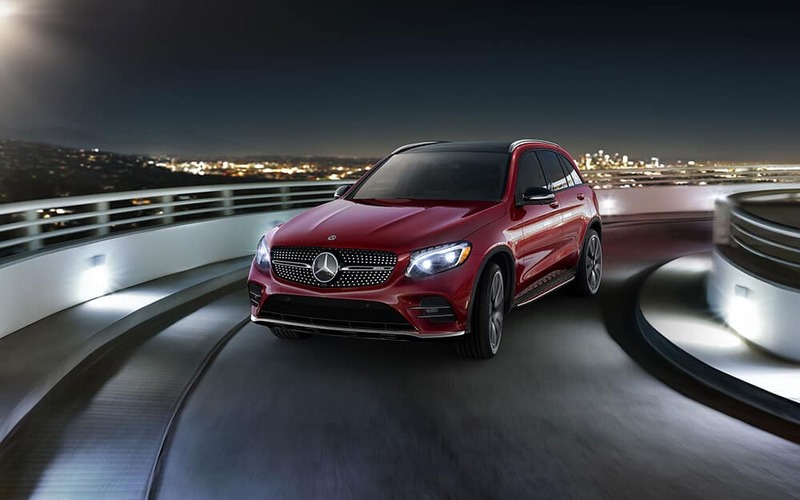 From performance specs to cargo space, the 2018 Mercedes-Benz GLC feels hard to beat. Schedule a test drive to experience it first-hand, or feel free to apply for financing online.